What jumps to mind when we say Bratislava…? If we were honest when invited to explore the capital of the Slovak Republic, there were very few preconceptions. Frankly, we just did not know anything about it as a destination at all. However, we are extremely happy to say that is no longer the case and in fact, Bratislava is now fixed in our minds as a fantastic destination for a whole range of events and incentives. Our two-day exploration began with an early morning flight from London Heathrow to… Vienna, Austria. This was the start of many pleasant surprises. Whilst Bratislava has a plethora of benefits to offer the events world, it all becomes a little more exciting when you realise that within 20 minutes’ drive you can be in either Hungary or Austria (Imagine touring the vineyards of these three nations in one trip, it is possible). However, do not be alarmed, there are direct flights into Bratislava from both London and Manchester with flight times approximately 2h 15m. Upon arrival, we were met by the brilliant team from the Bratislava Convention Bureau, who delivered us to our home for the next two days, Grand Hotel River Park. Nestled on the banks of the river Danube in a stylish and modern complex, this Luxury Collection Hotel has fantastic views across the Danube and if you are lucky enough to get a room on the higher floors, a view of the landscapes of Slovakia, Hungary and Austria. As you would expect from the Luxury Collection, this hotel has everything you need to make your stay comfortable and has even more to offer if you are planning an automotive event. With the ability to display cars in the hotel lobby and on the stunning external terraces with the Danube as a perfect backdrop. These can be rotated using the hotels car park for over 200 vehicles, which can be taken on exclusive use required. Not wishing to waste a moment, after dropping our bags into our rooms we set out to explore the town centre. Picked up by vintage Slovak buses and dropped on the periphery of the, now pedestrianised old town, we began a historical walking tour of this stunning city. One of the greatest assets of this city is the atmosphere. It is something that only the most eloquent of writers could relay in words (so our strongest suggestion is to check it out for yourselves), but, in a bid to help you understand, a tour of the town left us with a calming, almost revitalising energy. The streets aren’t busy, but they are bustling. The architecture appears ancient and grand whilst not imposing. The businesses that operate from within are fresh and vibrant, teaming with jovial sounds and mouth-watering aromas. Our favourite has to be Michaels Gate (the only remaining gate of the medieval fortifications) on Michalska Street in the centre. There are a range of restaurants and bars adorning the cobbles, with ancient lanes and hidden courtyards diverting the flow of pedestrians like tributaries of a river. After a delicious meal, the evening ended with a few hours in the spa, which adorns the top floor of the Grand Hotel River Park. With floor to ceiling windows looking over the evening skyline, there is no better place to relax and unwind. Our second day got off to an early start, we were met by a coach at the hotel lobby, before setting off on an approximately 40 minute journey to the Slovak Ring – Europe’s second longest motorsports complex. On first appearance, the complex appears a little basic in terms of supporting infrastructure, but in our experience with automotive events, this only adds to its charm. It is about as much of a blank canvas as you are going to get in terms of racing facilities, with endless branding opportunities and ample space for the addition of temporary structures. The course itself is extremely versatile with 6 configurations, and with 80% of the track visible from the main grand stand, there is a heightened sense of energy as the racing unfolds in front of your eyes. After leaving the track, we took a short journey (approx. 20 mins) to what we believe to be the jewel in Bratislava’s crown, X-Bionic Sphere. This stunning sports and leisure resort sits along the banks of the Danube, boasting 1,000,000 m2 of high-class sporting facilities for the performance of 27 Olympic disciplines (awarded official Slovak Olympic Training Centre). As well as the outstanding sporting facilities, amongst the manicured gardens and pristine walkways, the site boasts 282 bedrooms, 6 rooftop suites, 4 restaurants, state of the art conference and congress facilities and an onsite cinema. This resort offers complete privacy and is superb for launch events and larger incentives that may require exclusive use. After a short walk through the grounds, we arrived at the next of the days adventures. Awaiting at the private jetty on the banks of the Danube were a fleet of speedboats to deliver us to our next stop, The Danubiana private art museum. The Danubiana is not only home to a fantastic collection of modern art; it is a stunning destination for events such as product launches. Perched on a peninsula in the middle of the Danube, it is surrounded by the beautiful flowing waters with the Slovak hills silhouetted in the background. The perfect place for an event that demands a private location, perhaps enjoy a BBQ lunch or drinks reception in the grounds for an incentive trip. If you are looking to provide a little variety to the guests or add another exhilarating activity, the Danubiana neighbours the Cunovo Water Sports Complex – here guests can partake in a range of water sports including white water rafting, perfect for thrill seekers. One of the greatest benefits we discovered about Bratislava is its apparent proximity to everything. As we boarded our bus for the next stop we could be forgiven for being a little travel weary, but this was not the case, the distance between each of the activities was just enough of a welcome rest; but not enough to let the joints start to stiffen or the mind start to wander. The final activity before our dinner plans was definitely one we had been most intrigued by, a visit to the Volkswagen Bratislava Plant. This city within a city is probably one of the main catalysts for Bratislava adopting the title of “Motor City”. With around 33,000 direct and indirect employees at this facility, it feels almost like the Charlie and the Chocolate Factory of the automotive world. On entering through what can only be described as international border security, the sheer scale of the facility becomes apparent. Manufacturing 2,000 vehicles per day, this immaculately presented facility would be the envy of any company. Our astute tour guide was extremely knowledgeable about all aspects of the sites operations and was keen to share his experience first-hand; no question went unanswered which added something truly intangible to this experience. As we wandered around amongst musical robot transporters, watching men and machine work in perfect harmony to deliver what appeared to the naked eye to be one of the most uber efficient processes we had ever come across. This is a fantastic experience suiting corporate events that are looking to promote a message of improved productivity or efficiencies. This experience was only enhanced by the opportunity to take on the Touareg off road driving experience that is based on site. We can confirm first hand that, at least for the more novice of off-road drivers, it was a white-knuckle experience. After a hectic agenda, a relaxing dinner was something that was definitely required. 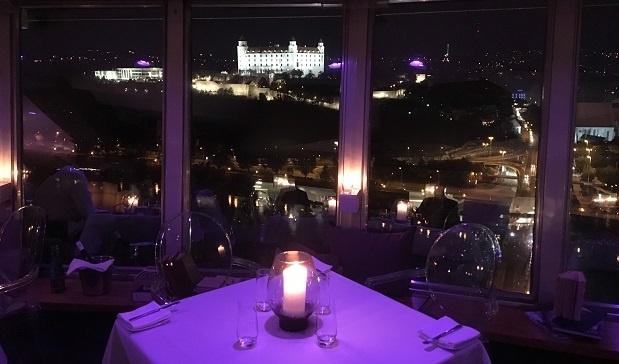 We were not disappointed, but just like our other experiences in Bratislava dinner came with a surprise. A very short drive led us to the foot of the bridge that cuts across the Danube in front of the old town, the bridge named “Most SNP” (“Bridge of the Slovak National Uprising”), has a single pylon, which soars high into the clouds; this was our dining spot for the evening. Entering the bridge at ground level, the lift takes 42 seconds to transport you to the “UFO”, as locals have lovingly named it. A disc shaped platform which houses an exclusive bar and restaurant with a fantastic open-air viewing gallery on its roof. The views, as you would expect, are truly breath taking allowing diners to gaze over the night’s sky as they feast on local delicacies as well as less traditional fayre such as kangaroo. The final surprise of the evening came when one of windows was thrust open and diners were offered the opportunity to take a skywalk around the periphery of the UFO. Balancing on a small ledge, brave participants ambled around with varying levels of confidence (securely fastened we must add). This is an experience we would heartily recommend, if the views, service, food and atmosphere were not enough, then the opportunity for another adrenaline kick should do it, and for those who don’t brave the sky walk, it is a great topic of conversation and a little humorous to watch. Heading back to the airport early next morning we were filled with excitement at the deluge of opportunities that Bratislava has to offer, it is our belief that we barely scratched the surface. 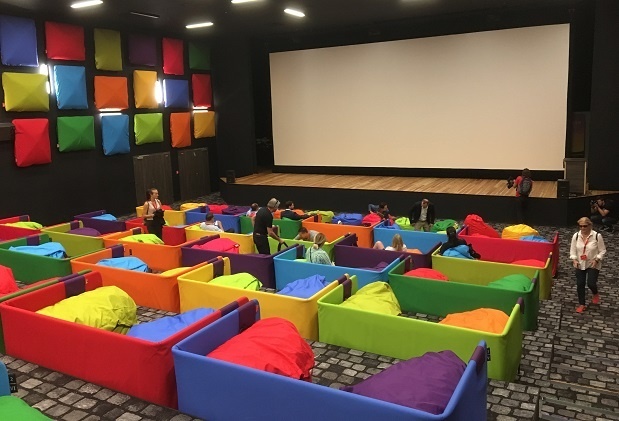 We will definitely to return to explore more of Slovakia and maybe even explore how a triple destination event or incentive could be maximised to its full potential.